On May 24, 2016, Monique Y. Wells successfully completed a Kickstarter campaign to support her mission of “Sharing A Master’s Art with the World.” The master is the abstract expressionist artist Beauford Delaney. The initiative is the latest of a series of Wells’ efforts on behalf of the late artist that began with the preservation of Delaney’s grave site near Paris and has included mounting an exhibition of Delaney works that have never, or rarely, been seen in public. Monique Wells is a travel writer and travel consultant who has lived in Paris for 24 years. Beauford Delaney was born in Knoxville TN in 1901 and lived in Paris for about 25 years until his death in 1979. 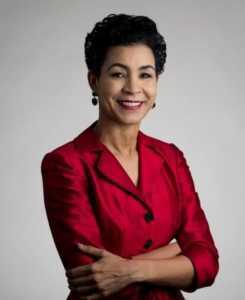 Wells recounted the history of her Delaney efforts during a phone interview from her home with WDAS-fm in Philadelphia on May 15, 2016. When Wells began doing research for an article about the burial sites of well-known black people in France, she didn't know much about Beauford Delaney. When she visited a cemetery office, she learned that Delaney’s grave was unmarked and his remains would soon be exhumed and anonymously disposed. The maintenance fees for his grave were not being paid. When Wells informed Delaney’s friends about the looming exhumation, they were distraught and provided the grave maintenance funds for her to pay on their behalf. They also wanted to raise funds for a tombstone — an effort which Wells successfully spearheaded. As part of her next effort on behalf of the artist, Wells said she wanted to make a STEM connection. Beauford Delaney and STEM? At first, it’s hard to see that connection. Delaney was interested in color and light, but as an artist, not as scientist, technician or mathematician. But in addition to her travel and cultural interests, Wells is a scientist — a veterinary pathologist and toxicologist from Houston, Texas. Her Wells’ Delaney/STEM connection began with The Beauford Delaney: Resonance of Form and Vibration of Color exhibition held in February and March 2016 at Columbia University’s Paris center. More than 40 paintings and works on paper — all from private collections in the Paris areas — were on view. Most had never been viewed by the public. Students from Columbia’s study abroad program, the University of Arizona, Virginia Commonwealth University, the Vassar-Wesleyan program, and Stanford University visited the exhibition. And, as part of the STEM aspect of the program, the Arizona students created an Augmented Reality app that allows users to access videos about numerous works in the exhibition. The program was sponsored by the Wells International Foundation (WIF) whose mission is to empower individuals – especially women and persons of African descent – through enriching educational and cultural opportunities. Most of the participants in the February-March 2016 Delaney exhibition activities were women. 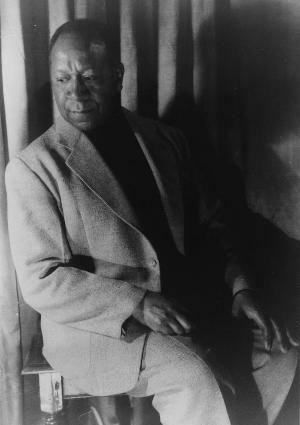 Recognizing that The Beauford Delaney: Resonance of Form and Vibration of Color exhibit makes a significant contribution to the history of African American art, American art in general, and to the history of that art in Europe, Wells wants to travel the show before the works go back to their private owners. And to interest museum curators and directors in hosting the exhibition, Wells wants to produce a video documentary on Delaney. To support this plan, she organized the Kickstarter campaign which ended on May 24, 2016. Exceeding the original goal of $5,000, the campaign raised $6,360. Scientist, writer, entrepreneur, art patron, foundation director, curator, fundraiser, Monique Y. Wells is a do-it-all dynamo! "The rise” continues in art historian Sarah E. Lewis’ own professional life. The Rise: Creativity, the Gift of Failure, and the Search for Mastery (Simon & Schuster, 2014) was Lewis' first book. Her most recent publication is the Summer 2016 "Vision & Justice" issue of the photography journal, Aperture, which she guest edited. For this special Aperture issue, Lewis invited noted scholars, museum professionals and artists from multiple disciplines to examine the role of photography in African American historical and contemporary experience. 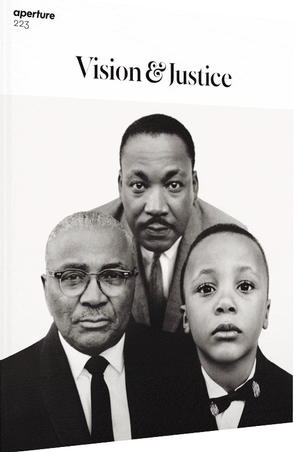 Richard Avedon, Martin Luther King, Jr., civil rights leader, with his father, Martin Luther King, Baptist minister, and his son, Martin Luther King III, Atlanta, Georgia, March 22, 1963 and Awol Erizku, Untitled (Forces of Nature #1), 2014. 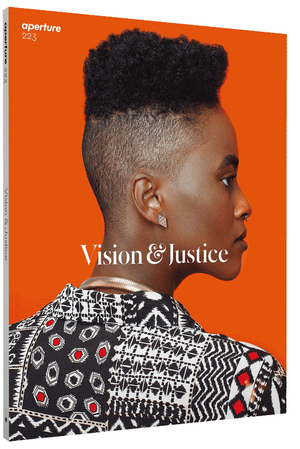 A complete listing of contents of Aperture's "Vision and Justice" issue is here. 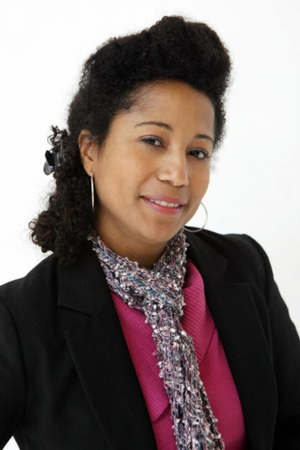 Sarah Lewis joined Harvard University’s departments of history of art and architecture, and African and African American studies as assistant professor in 2015. "Index/Sarah Lewis," profile by Andrea Douglas in the IRAAA print journal, Vol. 23, No 2. The photograph portfolio section of Sarah Lewis' "Vision & Justice" issue includes work by Toyin Odutola. The artist is having a busy year. On April 23, 2016, Toyin Odutola was keynote speaker at the Fourth Exposure Symposium at Mount Holyoke College. The symposium included talks by Lisa Lowe, Nikki Greene, Kellie Carter Jackson, Lyneise Williams and Sandy Alexandre; Dark Room: Race and Visual Studies Seminar professors Patricia A. Banks, Kimberly Juanita Brown, Iyko Day; Kia M. Q. Hall from the Five Colleges Women's Studies Research Center; and Aneeka Henderson from Amherst College. 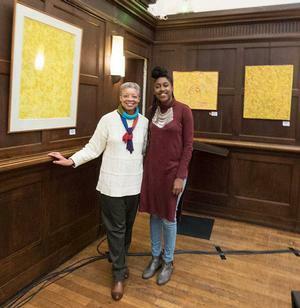 The symposium was organized Kimberly Juanita Brown who is a professor at Mount Holyoke and director of the Dark Room: Race and Visual Studies Seminar. On January 22, 2016, Odutola was interviewed by Brooklyn Museum curator Rujeko Hockley at Jack Shainman Gallery in conjunction with the artist’s show at the gallery, Toyin Ojih Odutola: Of Context and Without (December 11, 2015-January 30, 2016). At the start of the interview, which also included Odili Donald Odita, Odutola said that people viewing her work think it’s about "a Nigerian experience or something very specific." Instead, she said, "it's more about perception," and how the thought process works, and how the tool that she uses guides the work. The one hour and 20 minute interview covers numerous topics relating to the artist's personal life, materials and technique, politics and identity, and can be viewed here. Toyin Odutola was represented in four group shows during the first half of 2016. IRAAA+’s in-depth article on Toyin Ojih Odutola is here. At the Fourth Exposure Symposium, Toyin Odutola was introduced by Dell M. Hamilton. I work three days a week (rather than five) at the Hutchins Center. While I had been an assistant director working full time in a managment role, when I got a scholarship to do my MFA, Professor Henry Louis Gates, Jr. created a part-time position that allowed me to work a flexible schedule and work solely on special projects that had longer deadlines. With this current part-time role it's truly because of Professor Gates and the support of the executive director Abby Wolf and all my Hutchins Center colleagues that I have been able to stay productive in and out of academia. I graduated in 2012 from a three year studio art MFA program that stretched from Fall 2008 to spring 2012 because I had to balance job requirements, studio time plus a slew of art history requirements! I had a merit scholarship to attend the joint program run by the School of the Museum of Fine Arts and Tufts University both in Boston. But yes still balancing it all with duct tape, my IPhone and prayer. When I am not in Cambridge, I have to be self-motivated enough, EVERY SINGLE DAY, to invest in studio time, writing, research, networking, artist talks, teaching, curating, etc. So I treat this area of my life as a job unto itself taking up to 20-40 hours a week with not much time for a social life or for me stay as connected as I would like to be to my family and friends. On May 21, 2016, Dell M. Hamilton presented a new work that she curated at FiveMyles in Brooklyn. This evening of performance art that she's entitled “#BlackGirlLit: Between Literature, Performance & Memory” includes her work and that of other several other black women artists. 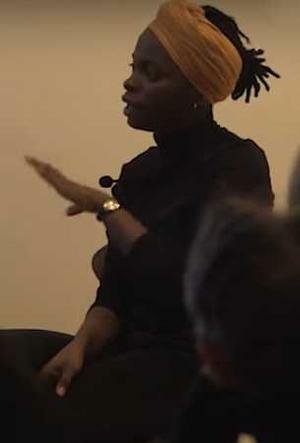 The event was an opportunity for her to investigate how black women's oral and written traditions are invoked within the framework of performance art. Details are here. On May 14, 2016, she performed with fellow artists Neil Leonard and Maria Magadalena Campos-Pons as part of the Smithsonian’s National Portrait Gallery performance art series, “Identify: Performance Art as Portraiture." In April 2016, she played African American frontierswoman Millie Ringgold in Mary Ellen Strom's short video, Grey Eagle, which was on view through May 14 at 555 Gallery in Boston. 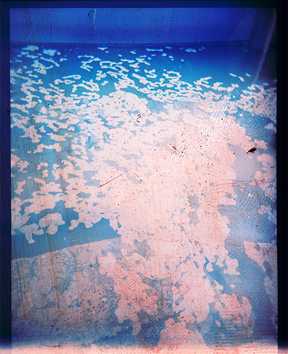 One of Hamilton's photographs from the series "Emulsions in Departure" was included in the New Art Dealers Alliance art fair (NADA) in New York, May 5-8. It was shown under the aegis of Samsøñ, a Boston-based internationally positioned gallery space headed up by Camilo Alvarez. She is participating in Samsøñ's by-invitation-only artist residency program through the end of August 2016. Last year Hamilton contributed reporting to this article in IRAAA+'s coverage of the Black Portraitures conference in Florence, Italy. Claudine Brown was among the first African American, full-time, professional museum educators, if not the first. Brown began her museum career as an educator in 1977 at the Brooklyn Museum and advanced in the field to become the Smithsonian Institution’s assistant secretary for education and access. The Smithsonian reported that Brown passed away March 17, 2016 after a long battle with cancer and listed her numerous career achievements. I read of Claudine's passing and was saddened to learn that such as powerful arts advocate has been silenced but her spirit continues on. 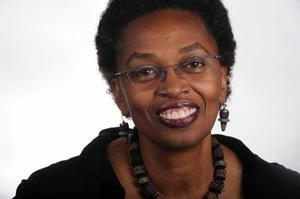 Claudine was added to the advisory board of the IRAAA sometime between 1990 and 1995 while she was at the Smithsonian Institution. Jeanne (Ziedler, former HU Museum director) developed a relationship with her then. As I recall, Claudine visited Hampton in our "new" building sometime in 2000 when she was director of the Nathan Cummings Foundation Arts and Cultural Program. The following year, right before Jeanne left Hampton, we were awarded a planning grant from the Nathan Cummings Foundation's initiative "Re-Envisioning" the role of museums in the community. We developed partnerships with several community organizations as we endeavored to increase our outreach in the Hampton Roads area. Claudine was always very supportive of Hampton University Museum. IRAAA+ contributing writer and editor John Welch recalls "a couple of one on one meetings” with Claudine Brown. Welch was museum educator and supervisor of education programs at the Metropolitan Museum of Art, 2005-2012. "As museum professionals we all benefitted from Claudine Brown’s accomplishment and pioneering presence,” says Welch. "Her illustrious career touched upon innumerable facets of arts education and community partnerships; youth development; museum leadership; and philanthropy. She nurtured and counseled many students and colleagues, astutely and willingly, to great purpose." On March 4, 2016, the Board of Trustees of the Barnes Foundation in Philadelphia announced that Pamela D. Bundy, president and CEO of Bundy Development Corporation, has been elected to the Board of Trustees after being nominated by Lincoln University. Pamela Bundy graduated with honors from Lincoln University. The University was given the authority by art collector and Barnes Foundation foundation founder Albert Barnes to nominate trustees of the Foundation, after his death. Pamela Bundy founded Bundy Development Corporation (BDC) to strengthen neighborhoods in Washington DC and over the past decade, the corporation has been an integral part of the rebirth of the city's downtown. BDC has been a partner in the development of more than 685 condominiums and approximately 100,000 square feet of retail space; and “CityCenter,” a $1 billion, 10 acre, mixed-use development. The Barnes’ Nari Ward Sun Splashed exhibition (June 24 - August 22, 2016) should promote Pamela Bundy’s interest in serving diverse communities. Sun Splashed was organized by the Perez Art Museum Miami and opened there. Persons who were opposed to HBCU Lincoln losing control of the Barnes Foundation (by no longer having the authority to make most of the trustee nominations) may be placated by such exhibition scheduling, related programming and the election of prominent African Americans such as Catherine Liggins Hughes, Khalil Gibran Muhammad, Brenda T. Thompson and Bundy to the Foundation's board. In remembering the late Julian Bond through his interest in visual art, we were interested to learn how the Lincoln University-Barnes Foundation relationship developed through Horace Mann Bond, Julian’s father. That Bond-Barnes history is detailed in this IRAAA+ article. Animated by flânerie (the artistic leisurely strolling, window-shopping, and people-watching of the bohemian artist/poet) that was an important strategy of the French Impressionists, and making reference to African tribal art, Ward’s oeuvre resonates with the Barnes collection and speaks with penetrating insight and imagination to a broad range of subjects, including black history and culture, the dynamics of power and politics, and Caribbean diaspora identity.